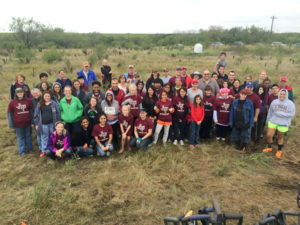 Keep Lewisville Beautiful provides volunteer opportunities throughout the year for the community to take part in and help our local environment. While we offer several ongoing volunteer opportunities, these are the three big events that KLB hosts annually. 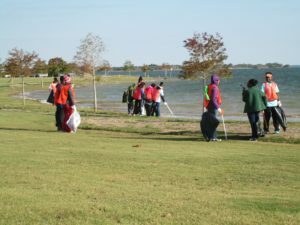 In partnership with the City of Lewisville, KLB hosts it’s annual Spring Clean up event the first weekend in April from 8am to Noon, held in conjunction with Keep Texas Beautiful’s Trash Off and Keep America Beautiful’s Great America Clean Up activities. With the help of hundreds of volunteers, this event focuses on a city-wide clean up of Lewisville with special attention on areas in need. KLB sends out teams to over 85 pre-determined locations, where each team focuses on cleaning their spot and reports back at onsite for trash count, a free educational expo, and free volunteer lunch. This is the biggest event that KLB hosts, drawing upwards of 700 volunteers for a service project that helps reduce litter in our parks, streets, medians, and more. This is a great event for all ages, and is a great way to get your family, business, or organization involved. KLB provides all materials needed and even offers a free volunteer lunch, drinks, goody bags, and door prizes. Awards are also given out at the event for adult and youth categories, such as “most unusual piece of trash found” and “most trash collected”. To find out more about the Spring Cleanup, register, and more, please visit our Spring Cleanup page. Every year in October, KLB participates in the nation-wide Make a Difference Day; a day dedicated to giving back to the community through volunteerism. KLB partners with local organizations, civic groups, scouts, schools, and the City of Lewisville to focus on beautification and community improvement projects that enhance public spaces, outdoor learning areas, and increase pollinator habitat in Lewisville. This ongoing project is a lot of fun for the entire family, and is safe for all ages. It is a continuing project year after year, in hopes of changing the image of our great city and making Lewisville the most beautiful that it can be. To find out more about the Spring Cleanup, register, and more, please visit our Make A Difference Page. 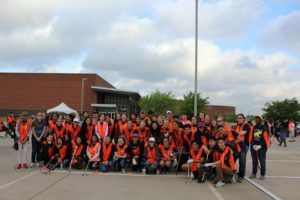 In partnership with the City of Lewisville, Keep Lewisville Beautiful hosts an annual waterway cleanup that focuses on cleaning the Trinity River, Lewisville Lake, their respective shorelines, and 16 local creeks that feed into Lewisville’s local watershed. The Trinity Trash Bash event is held in conjunction with Keep Texas Beautiful’s Keep Texas Waterways Clean program, and the Trinity River Environmental Education Society’s Trash Bash program. Hundreds of volunteers meet at Lake Park to help clean more than 40 locations across the city. This is a great event for all ages, and is a great way to get your family, business, or organization involved. KLB provides all materials needed and even offers a free volunteer breakfase, drinks, goody bags, and door prizes. Awards are also given out at the event for adult and youth categories, such as “most unusual piece of trash found” and “most trash collected”. To find out more about the Trash Bash Cleanup, register, and more, please visit our Trinity Trash Bash page.